Updated Saturday, Nov. 17, 6:52 p.m. It was clear on election night that Democrats would have control of the U.S. House of Representatives starting in 2019, but it wasn't clear how many California Democrats would be a part of that majority. The final victory came in the form of Gil Cisneros, who the Associated Press on Saturday night projected as the winner of the open race for the 39th District, which includes parts of Orange, Los Angeles and San Bernadino counties. Cisneros overcame a 4,000-vote election night lead by Republican Young Kim, steadily closing the gap before finally taking the lead for good on Thursday. The seat was vacated by 13-term Republican Rep. Ed Royce, who chose not to run for re-election in a district that splits equally among Democrats, Republicans and independents. 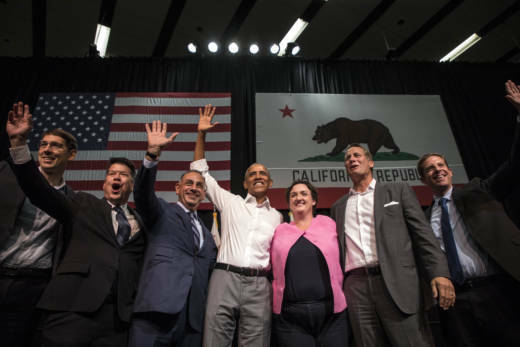 A few days earlier on Thursday, AP called the race for California's 45th District for Democrat Katie Porter, unseating incumbent Republican Rep. Mimi Walters in the Orange County district. Porter, a UC Irvine law professor, trailed by 6,000 votes at the end of counting on election night, but she gained ground each day as more votes were tallied, eventually overtaking Walters on Tuesday evening, one week after Election Day. During the campaign, Porter attacked Walters' support for Trump's tax cuts and offshore oil drilling. Earlier in the week, AP called the state's 10th District for Democratic challenger Josh Harder over incumbent Republican Rep. Jeff Denham. Denham was up by as many as 1,300 votes the day after Election Day, but his lead started to shrink, and Harder overtook him on Friday, eventually stretching his lead to nearly 5,000 votes before AP called the race. The proximity of this Central Valley district, which borders the Bay Area, led many Bay Area liberals to pour time and money into Harder's campaign, which raised $7 million in its bid to unseat Denham. A week ago, Democratic challenger Harley Rouda declared victory over 15-term incumbent Republican Rep. Dana Rohrabacher, and AP called the race for Rouda later the same day. The GOP has a 10-point registration advantage in this district, but Rohrabacher was seen as vulnerable, in part because of his close ties to Russia. Rouda, a former Republican, also criticized Rohrabacher — who has represented the Huntington Beach area for three decades — for not showing up for his constituents. Even though Republican incumbent Rep. Steve Knight conceded his race against Democratic challenger Katie Hill the day after Election Day, AP didn't officially callthe race for California's 25th District until a few days later. Hill had outraised Knight during the campaign, in a district that sits at the northern edge of Los Angeles County and includes portions of southern Ventura County. Hill tried to take advantage of demographic changes in the district, which has become less white and more diverse. The earliest Democratic victory in these swing districts was environmental attorney Mike Levin. The day after Election Day, he was declared the victor in a tight race for a seat left open by the retirement of longtime Republican congressman Darrell Issa. Levin took on Republican Assemblywoman Diane Harkey in a district that covers northern San Diego County and part of southern Orange County. Like many Democrat candidates, Levin far outraised Harkey. The one bright spot for Republicans was the re-election of Republican Rep. Duncan Hunter, who was declared the winner on the same day as Levin in a tighter-than-expected race against Democratic challenger Ammar Campa-Najjar. This race was expected to be a significant reach for Democrats, who wanted to unseat incumbent Hunter in this eastern San Diego County district that Trump won by 15 points. But after Hunter was indicted for allegedly using campaign money as a personal slush fund, Campa-Najjar was able to parlay those legal challenges into a strong fundraising push and catch up to him in the polls in the final weeks of the campaign, even as Hunter attacked him with false smears.